Positioned at the eastern tip of the Costa del Sol, on the seashore some 50 kilometres from Málaga, Nerja boasts nearly 10 miles of powdery beaches featuring activities like water skiing, scuba diving and sailing. Although tourist-oriented, it hasn’t been overtaken by high-rises, and its huge promenade delivers panoramic Mediterranean views. Once a sleepy fishing village, the town now has a population of over 22,000. 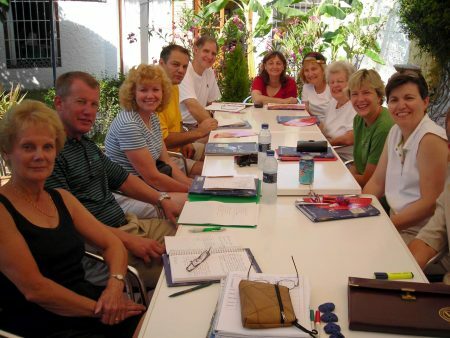 The Escuela de Idiomas Nerja, founded in 1980, stands in the very centre of town, housed in a typical Andalusian building with a good-sized tropical garden, only a few minutes’ walk from the local scenic beaches. Nearby, you will find all types of shops, boutiques, restaurants and night spots, which will help make your stay both lively and enjoyable. The School has 14 fully-equipped classrooms (interior and exterior). Special mention should be made of the garden, which is perfect for holding class or just relaxing during breaks at our outdoor cafeteria. 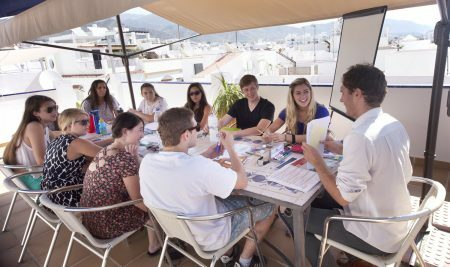 Escuela de Idiomas Nerja is a School Accredited by Instituto Cervantes, and belongs to several language teaching Associations in Spain and abroad: IALC (International Association of Language Centres), FEDELE and Español en Andalucía. It cooperates with the Madrid Chamber of Commerce, the University of Castilla La Mancha and ESERP (business school). 20 hours per week. 1 hour = 50 minutes. Maximum of 10 students per group. Duration: 1 to 32 weeks. Course timetable: mornings or afternoons. All levels. Minimum age: 16 years old. Starting date: any Monday. Beginners: twice per month. 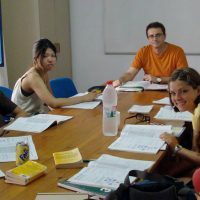 General course in Spanish language, culture and civilization for adults of all nationalities, imparted using the communicative method, with emphasis laid on the performance of tasks that enable real communication processes to be practiced and the respective language skills – speaking, reading, writing and listening- to be put to use. 30 hours per week. 1 hour = 50 minutes. Maximum of 6 students per group. Duration: 1 to 16 weeks. Course timetable: mornings. All levels. Minimum age: 16 years old. Starting date: any Monday. Beginners: twice per month. 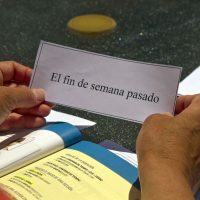 While both course content and goals coincide with those of the Standard Intensive Course, the additional hours are devoted to more intensive, faster language acquisition, in line with pupils’ specific needs. Accredited course for obtaining the “Bildungsurlaub” in Germany. 20 or 30 hours per week. 1 hour = 50 minutes. Duration: 1 to 12 weeks. Course timetable: mornings or afternoons. All levels. All ages. Starting date: any Monday. Possibility of obtaining the Diploma in Commercial Spanish (D iplo m a de Españ ol Com ercial) issued by the Madrid Chamber of Commerce. This is a custom-made course catering to students’ individual interests. It is a specialised intensive course for pupils with very specific needs in general or professional Spanish, such as business, corporate affairs, tourism, banking, medicine, etc., or for specific examinations, such as the Diploma in Spanish as a Foreign Language (Diploma de Español como Lengua Extranjera – D.E.L.E), university, school-leaving and others. 15 hours per week. 1 hour = 50 minutes. Maximum of 10 students per group. Duration: 1 or 2 weeks. Course timetable: mornings. Three levels: A1, A2 and B1. Consult dates. Includes cultural and leisure activities for two weeks, with a day trip on Saturday. 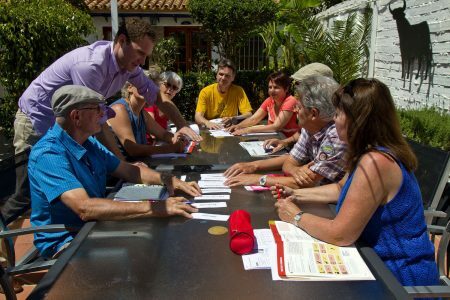 Designed to give pupils over 50 years of age the chance of having a cultural experience while learning the language. Ideal for practising Spanish while enjoying our customs and culture. Club 50+ Activities: Welcome meeting, Tour of Nerja with a bar invitation, Visit to Frigiliana (Andalusian white town), Spanish wine tasting Seminar, School party (1 per month), Excursion to Granada or Malaga, Spanish film, Cultural Seminar, Cookery class, Visit to Prehistorical caves of Nerja, Deliver of Certificates. Activities can change according to the School organization. 30 hours per week. 1 hour = 50 minutes. Groups: 4 to 8 students. Duration: 2 weeks. Course timetable: mornings. Scheduled starting dates. 25 hours per week. Standard Intensive Course (20 hours per week) + 5 h ours of private class of commercial Spanish. 1 hour = 50 minutes. Duration: one week upwards. Course timetable: mornings. Starting date: any Monday. Minimum age is 18 years old. Courses and examinations recognised by the Madrid Chamber of Commerce. Levels offered: Basic (B2) and Proficiency (C1). The Chamber of Commerce examinations are optional and will be held at the School at the end of the course. 30 hours per week. Groups: 4 to 8 students. Duration: 1 week. Course timetable: mornings. Scheduled starting dates. 25 hours per week. Standard Intensive Course (20 hours per week) + 5 h ours of private class. Duration: 1 week upwards. Course timetable: mornings. Starting date: any Monday. 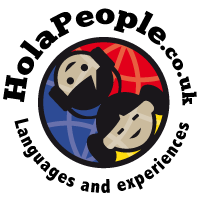 Training course to bring SFL teachers with or without experience up to date: includes methodology, methods and resources for the classroom, new technologies applied to the teaching of second languages, negotiation of goals, assessment, how to teach grammar involving special difficulty, Spanish culture and literature, and game- playing component. (Diploma de Español como Lengua Extranjera – D.E.L.E.) 25 hours per week. Standard Intensive Course (20 hours per week) + 5 hours of private class to prepare for the examination. 1 hour = 50 minutes. Duration: 1 week upwards. Course timetable: mornings or afternoons. All levels.Minimum age is 16 years old. Diplomas in Spanish as a F oreign Language (Diploma de Español como Lengua Extranjera – D.E.L.E) are official certificates granted by the Cervantes Institute on behalf of Spain’s Ministry of Education (Ministerio de Educación de España), accrediting the holder’s degree of competence in and mastery of Spanish. 20 hours per week in a Standard Intensive Course. Maximum of 10 students per group. Course timetable: mornings. Over 5 hours of FLAMENCO lessons. Course timetable: afternoons. Duration 1 to 4 weeks. 20 hours per week in a Standard Intensive Course. Maximum of 10 students per group. Course timetable: mornings. Over 5 hours of SALSA lessons. Course timetable: afternoons. Duration 1 to 4 weeks. 20 hours per week in a Standard Intensive Course. Maximum of 10 students per group. Course timetable: mornings. Over 5 hours of TENNIS lessons. Course timetable: afternoons. Duration 1 to 4 weeks. 20 hours/week, Intensive Course. Course timetable: mornings. Over 4 hours of DIVING lessons. Course timetable: afternoons. Duration 1 to 2 weeks. 20 hours/week, Intensive Course. Course timetable: mornings. Over 4 hours of GOLF or PHOTOGRAPHY lessons. Course timetable: afternoons. Duration 1 to 4 weeks. For groups of teenagers aged 12 to 18. 15 or 20 hours per week. Course timetable: mornings. Duration 1 to 4 weeks. Spanish language and civilization course. What an Intensive Course includes? Written test of students’ initial level. Oral test of students’ initial level. Course presentation and classification by level. Every Monday, based on a morning timetable. Welcome and presentation of activities programme. Every Monday, based on an afternoon timetable. Certificate and Diploma (of a personal and private nature). Seminars on Spanish Culture and Civilisation. Seminars form part of the language course. Volleyball in summer, films and School parties. 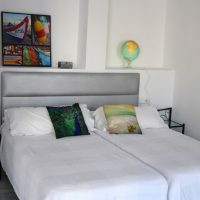 The Moorish-Andalusian style Club Costa Nerja with 24 rooms, is located in the Old Quarter, just a few minutes’ walk from the School and beaches. Apart from its attractive terrace and swimming pool where you can sunbathe, with views across to the sea and mountains, the building is equipped with all modern conveniences, including a lift, air conditioning, heating and solar energy and free WIFI in all rooms. Double or single. Continental breakfast included. Double or single. Continental breakfast included. Minibar and kettle. Four studios at Club Costa Nerja at the disposal for our students. Free WIFI, sitting room area, open concept kitchen, modern bathroom with shower, separated bedroom area. All rooms come with bathroom and flat screen TV. The cleaning service operates from Monday to Friday. Rates include a change of towels twice a week and change of bed linen once a week. The Club kitchen is a shared facility, freely available to all students staying there. Student’s Common Room: meeting place for e-mailing, doing homework, requesting reading matter, consulting a teacher or just relaxing over a quiet drink. Cafeteria. TV room. Internet service. Free WIFI. Library. Study Room. Cinema with a wide selection of films in Spanish. Lunch or dinner service (Spanish restaurants). Pleasant, comfortable and located on the School’s premises. The apartments have living room, bedroom, fully-equipped kitchen, bathroom and ample terrace with views of the garden. Facilities: TV, washing machine, air conditioning/ heating, solar energy. Bed linen and towels, Free WIFI service. Flats include the use of the Club Costa Nerja swimming pool and end- of-stay cleaning service. A ten-minute stroll away from the School and beaches, the flats are spacious and give tenants right of access to the communal swimming pool. Living room with TV, fully-equipped kitchen with washing machine, and good-sized bathroom. Bed linen, towels and end-of-stay cleaning service included. 1 to 4 persons. Ideal for pupils who wish to live with a Spanish family, learn about their customs and get even more language practice. All our registered families will treat you as just another member of the family. 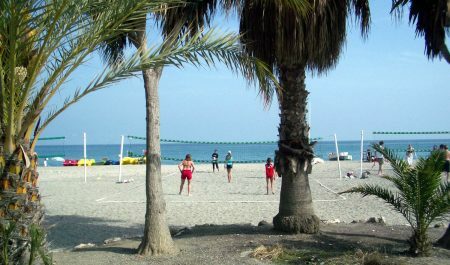 Homes lie within a short distance from the School and Club Costa Nerja (a maximum of 20 minutes on foot). Single or double shared room (for students travelling together) with half-board (media pensión): breakfast and lunch. 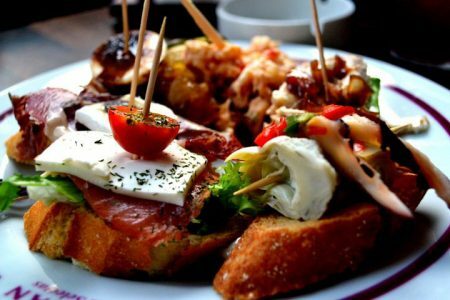 The main meal of the day in Spain is “al mediodía”, i.e., lunch, from 1:30 to 3 p.m. Very comfortable flats, near the School and beaches. Each student has his/her own room with shared common areas (fully-equipped kitchen, living room with TV, and bathroom) Bed linen and towels are provided, and the end-of-stay cleaning service is included. 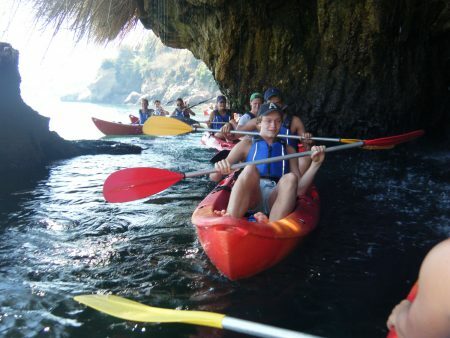 Outings to the prehistoric caves of Nerja and the picturesque towns in the vicinity, such as Frigiliana and Almuñécar. Daytrips to Granada, Seville, Malaga and Cordoba. Spanish films and other interesting events. Seminars on Spanish culture and civilisation. Cookery classes and wine tasting. Every Monday there is a welcome gathering for the presentation of activities in which new students meet one another and enjoy typical Spanish hospitality. Bus service from the airport to Malaga city centre (Central Bus Station) every 20 minutes. From here, buses leave for Nerja every hour. The journey takes approximately one hour. Taxi from the airport to Nerja. The School ferry taxi service: from Malaga International Airport to your chosen accommodation. The School is covered by an insurance of civil responsibility for its students on the school premises. The Spanish Social Security offers medical attention to citizens of the European Union. Other nationalities should consult their insurance company about Spanish Social Security entitlement before they visit Spain. This covers your lost programme cost if you are forced to cancel your programme prior arrival due to your own illness, or the serious illness of a close family member (parent, wife…). For illness, a medical certificate is required for reimbursement. The cancellation insurance and travel costs are not reimbursed. Students who wish to take out health, accident, liability and luggage insurance, may book our Medical insurance. The School fulfil the legal requirements concerning Prevention of risks, fire, health, accidents in our premises. We follow an annual “prevention plan” managed by Prevesalud S.L –Malaga. This accredited company audits our premises every six months, trains our staff in prevention and expend the required legal documents. PREVESALUD S.L., assigned business tax ID (CIF) No. 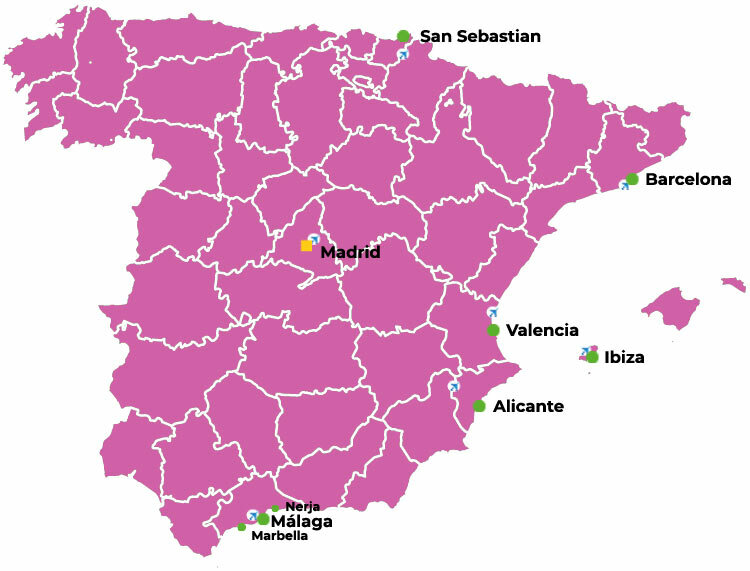 B-92.211.663, officially approved by the Regional Government of Andalusia to act as an External Prevention Service pursuant to authorisation SP 86/01-SC. That the company ESCUELA DE IDIOMAS NERJA S.L. has contracted the company PREVESALUD S.L. to provide services as an External Prevention Service in the areas of: Workplace Safety, Industrial Hygiene, Ergonomics and Social Psychology and Health Monitoring. Said contract was signed in Fuengirola on 22 February 2006. That the contract is valid until 22 February 2011. On that date it will be renewed for one more year if both parties are in agreement to do so. Risk assessment, Prevention plan, Information on risks and adopted measures, Prevention system management manual, Employee training and information, Emergency measures, Accident investigation, Verification of the management system implementation, Technical consulting, Health monitoring. That, therefore, it effectively manages Occupational Risk Prevention at its company. And in witness whereof for all pertinent purposes, this certificate is signed in Fuengirola on 7 June 2011. Signed: PREVESALUD, S.L. We would recommend to our students that they take out insurance for illness, accidents, thefts and even cancellation. 11 days to 4 weeks before the course starts. Cancellation costs: 150 €. More then 4 weeks before the course starts. Cancellation costs: 60 €. Once the course has begun no money whatsoever will be returned. 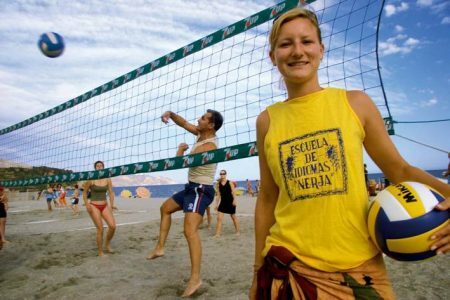 Students, who come to the Escuela de Idiomas “Nerja” through an organization, should contact that organization regarding any question of payment cancellation. Can understand and use familiar everyday expressions and very basic phrases aimed at the satisfaction of needs of an immediate type. Can introduce him/herself and others and can ask and answer questions about personal details, such as where he/she lives, people he/she knows and things he/she has. Can interact in a simple way provided that the other person talks slowly and clearly and is prepared to help. Can understand sentences and frequently used expressions related to areas of most immediate relevance (e.g., very basic personal and family information, shopping, local geography, employment). Can communicate in simple and routine tasks requiring a simple and direct exchange of information on familiar and routine matters. Can understand the main points of clear standard input on familiar matters regularly encountered in work, school, leisure, etc. Can deal with most situations likely to arise whilst travelling in an area where the language is spoken. Can produce simple connected text on topics which are familiar or of personal interest. Can understand a wide range of demanding, longer texts, and recognize implicit meaning. Can express him/herself fluently and spontaneously without much obvious searching for expressions. Can use language flexibly and effectively for social, academic and professional purposes. Can produce clear, well-structured, detailed text on complex subjects, showing controlled use of organisational patterns, connectors and cohesive devices. Can understand with ease virtually everything heard or read. Can summarise information from different spoken and written sources, reconstructing arguments and accounts in a coherent presentation. Can express him/herself spontaneously, very fluently and precisely, differentiating finer shades of meaning even in the most complex situations. On the first day of course, students are given a written classification test and an oral interview to allocate them to the group best suited to their level. It may be that there is just one student at a given level. In such a case, we would offer him/her a smaller number of private class hours, to a total amount equivalent to the established rate for that course level. Detailed information on the daily course programs are displayed on the School boards and at disposal of students and agents in advance. Timetable with the names of the teachers and classroom. • Materials for the course. An introduction by our Coordinators. Student First Day fact sheet. New students should arrive at the Club Costa Nerja in C/ San Juan 39, Monday at 8,30 h, when they should go to the Reception desk and identify themselves. If we have received a student’s test he/she will be called in for an interview, lasting approximately 10 minutes, with one of our coordinators. If we have not received the pre- test, he/she will have to do a written test before the interview, which will determine his oral level. After all the interviews have taken place, and after a Staff ́ meeting, all the students are called in to receive their timetables, the levels and groups assigned to them, the teachers ́ names, the name of the classroom and teaching material. They will be accompanied to their classrooms, and those students who have a timetable for morning classes will start there and then. Those whose timetable is for afternoon classes should return to the Centre in the afternoon. Every two weeks the students are given a test to evaluate their progress. If a student’s overall evaluation is below 60%, he will have to repeat the level or the last week, as appropriate. The level test at four weeks normally represents a complete level, for which there is a final exam to be taken and passed. Books are not included. Cost of book: approx. 19,50€ every 2 weeks. Within the first five days of each stay, the School evaluates the participants’ satisfaction with the course and contracted services, in particular the welcome, accommodation (if contracted) and tuition. Feedback is systematically processed by the management. Our staff ensures that any problems are checked and, when appropriate, investigated and/or resolved. At the end of the stay the School asks the participant to fill out a questionnaire regarding the services which are contracted, such as: the course, the accommodation; the activities, such as cultural activities, sports, excursions. Average temperature during winter: 18o C.
Average temperature during spring: 24o C.
Average temperature during summer: 30o C.
Opening hours of shops: from 9.00 h to 13.30 h or 14.00 h, and from 16.30 h or 17.00 h to 20.00 h or later. Banks are only open during the mornings: Monday to Friday from 9.00 h to 14.00 h.
Most Spanish houses use butane gas cylinders for cooking and hot water. Approximate cost of: Cinema3-5€,1coffee1,50€,1coke1-2€,1sandwich3–5€,1meal8–40€,1laundry6–8€, 1haircut15–20€. Procession and fireworks in Maro. Three wonderful days full of colour with the Chirigotas (popular songs) and the great street parade. Holy week with processions full of emotivity and simplicity. • 3 May. Cruces de Mayo. Flowers crosses made by neighbours of Nerja singing and dancing around them. Honey specialities: Arropía (caramel) and Marcocha (popcorn with honey). Outburst of joy in the pilgrimage of horses and Spanish costumes. Barbecue night and beach day. Cake speciality: Tortas de San Juan. Fishermen ́s feast day. Marine procession carrying the Virgin in the fishing boats. Flamenco and classic music festivals in the Cave of Nerja. 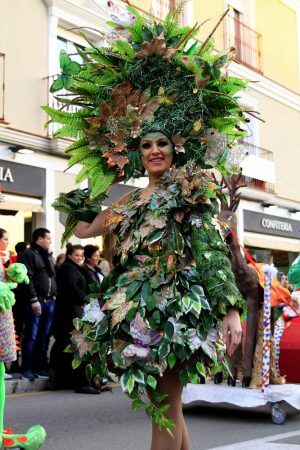 Local Saint’s day festivities with fair in Maro. • 8-12 October. Feria de Nerja. Local Saint ́s days with great fair and amusements.